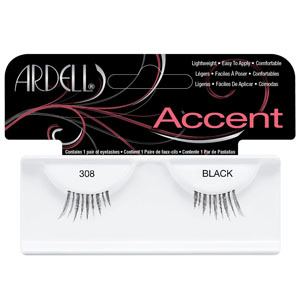 The perfect way to accentuate your natural lashes, Ardell 308 Accent Lashes are a set of glamorous half sized lashes designed to enhance your natural lash flutter, with high definition and volume to help enhance your already fabulous look. 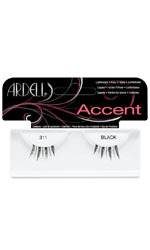 The Ardell Accents False Eyelashes are shorter than a regular strip lash and are to be used on the outer corners of the eyes for a flawlessly blended, natural look. Crafted with 100% sterilised Human Hair, perfect for any eye shape or occasion. How to apply: Lay lash on top of your natural lash. If it extends beyond your lash line, trim the excess with small scissors. Squeeze a thin line of LashGrip Adhesive along the lash band. A toothpick can be used to spread it evenly. Wait about 30 seconds for adhesive to set. Place the lash as close to your natural lash line as possible. Use your fingertip to gently press along the band to secure in place.